← Join Venice Piazza’s Ultimate Asian Destination Promo! We were at Bonifacio Global City last Sunday hopping from Market Market to Serendra to Bonifacio High Street. We meant to try a new restaurant before going home, and hubby decided to treat us to dinner at Kabisera ng Dencio’s. Kabisera ng Dencio’s is a classy, intimate restaurant that offers Filipino dishes with a twist. We ordered four of their bestsellers, namely: the Sinampalukang Lechong Manok, Krispy Sisig, Sin-Turon and Pink Lady. This is lechong manok (roasted chicken) in tamarind leaves broth. We were all excited to try this because it was something new to us. 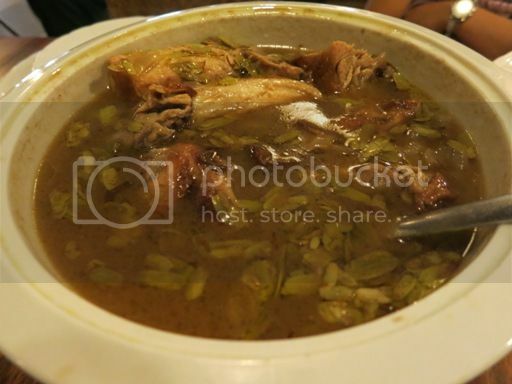 This Sinampalukang Lechong Manok was all that our young man had with his rice, and you know what, he liked it very much! He only discovered that it was a bit too sour when he was almost done eating. Lol! We would have enjoyed this chicken dish more if the sourness of the broth had been reduced. What we loved about this is that the pork bits were really crispy, there were lots of onions, and it was served on a sizzling plate. Yummy! 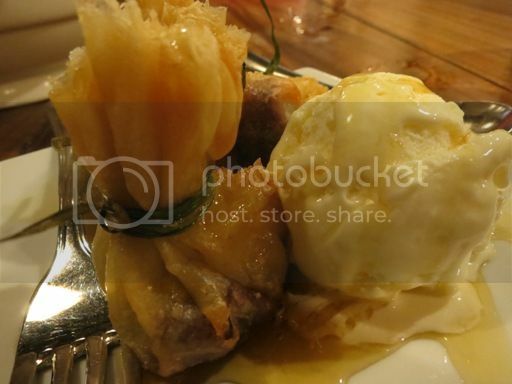 This is turon with ube, langka and macapuno with ice cream on the side. This was sinfully delicious! We’d love to have this again! 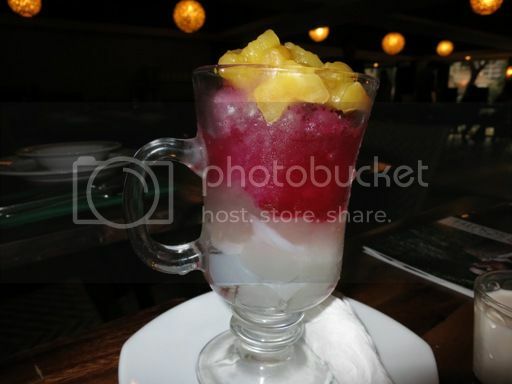 This halo-halo dessert has nata de coco, macapuno, water chestnuts, kaong, langka slices and sugar beets. It is called “Pink Lady” because it turns pink after mixing all the ingredients. There’s nothing extraordinary about this, except the color. Next time we’d like to try their Tsokolate Eh at Suman. 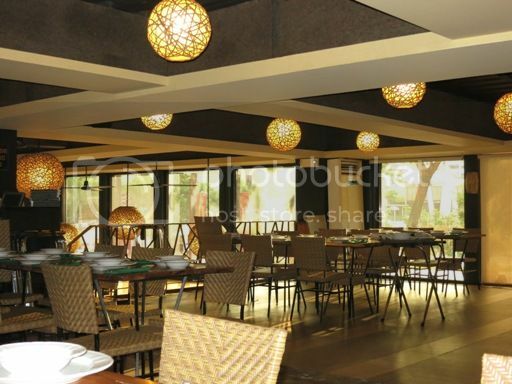 Overall, Kabisera ng Dencio’s is a lovely restaurant; the food was okay but a bit pricey. However, we wished there were more waiting staff at the second floor of the restaurant where we dined because there were instances where there was none when we needed one. G/F Bonifacio High Street, 7th Ave. 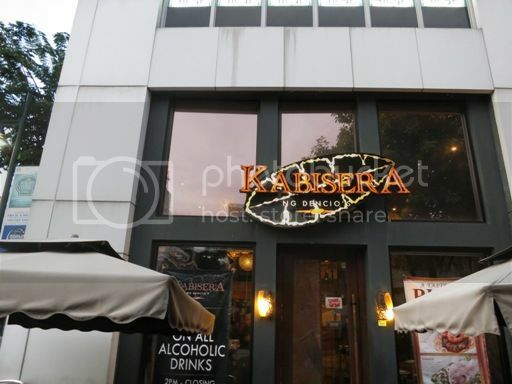 This entry was posted in Filipino Cuisine, Food Friday, Food Trip Friday, Kabisera ng Dencio's. Bookmark the permalink. I was about to say “pricey.” How was the sisig? Sin-turon I’d like to check out. Looks like the price is not that high. I am amazed of so many restaurants in Manila and they are offering good food. 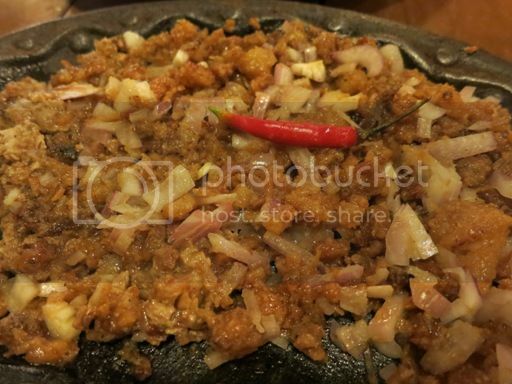 Dencio’s sisig is my favorite but I haven’t tried dining at this high end version. Kind of pricey especially when compared to the normal Dencio’s. yummmy! everything looks real good, but that sisig got to me…lol. would love to order one of those someday! thanks so much for sharing and linking over at Food Friday, sis! I’m always on the lookout for new eats and since I haven’t tried Kabisera ng Dencios, i’ll put that on my list! :) The Sinampalukang Lechong manok looks interesting! I love sisig! And their version looks so tasty. Too bad they are located so far away, but the next time we are in BGC, we will surely give this resto a try.